We do participate in the upcoming ACHEMA 2018 exhibition in Frankfurt, Germany. 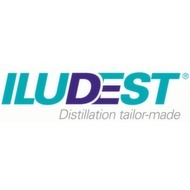 The introduction of an automized distillation unit, designed by ILUDEST®, is one of the more effective means of improving efficiency. Comprehensive range of microprocessor operated units for various control modes/functions. The indication of all set points and actual values is done via a LC-display. The control is menu-guided by means of a "push -turn" knob. Highly efficient - Due to a careful selection of the appropriate components we achieve best standards of efficiency at high throughput rates. A New Distillation Plant Extends Physical Limits outsmarted? “The Masters of the Columns” was our title three years ago, when PROCESS visited the firm Iludest/i-Fischer and subsequently outlined their work. Now these masters are once again attracting attention by presenting a new phase equilibrium device.